*Please enjoy this prerecorded message, since I live in an awkward internet deadzone located a mere 5 minutes from civilization. I am currently doing fun, non-internet-related stuff like packing, cleaning my basement, and not checking Facebook. Here’s a random question: do you like pickles? I’m kind of ambiguous when it comes to eating pickles, but I do like to make them. That’s probably weird, right? Well, I also like them because they’re a summer food, and with temperatures getting near and above 70 in Michigan, you have to know that summer’s not far away. Anyway, here are two recipes that make really good pickles. One for refrigerator dill and the other for bread and butter. Recipe by Tammy Gulgren and sourced from allrecipes.com. Stir water, vinegar, sugar, and sea salt together in a saucepan over high heat. Bring to a boil; remove from heat and cool completely. Combine cucumbers, onions, salt and ice in a large bowl. Put a weight on and allow to stand 3 hours. (For a weight, I use a plate with a gallon bottle of vinegar or water on top of it). Do you know how to can? Are you a seasoned veteran of the steamy summer canning kitchen? 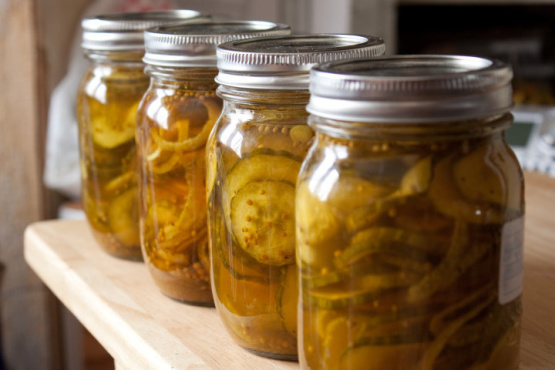 Can your grandmother’s pickle recipe beat up cuisinebymae’s grandmother’s pickle recipe? Let me know in the comments. I hope you’re having pickle-perfect weather in your neck of the woods this weekend! Sounds yummy! 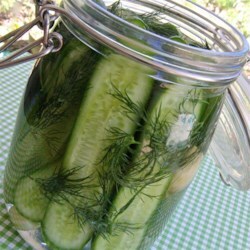 There are so many additives in store-bought pickles, this seems like a great way to satisfy a craving. Is the sugar absolutely necessary for the dill pickles? Thanks, that sounds fantastic, and just about the right level of effort 🙂 I think I am irrationally afraid of canning, I assume I will get automatic botulism. I’m not a fan of pickles. I learned how to can a few years ago. I don’t do much of it, but it’s great to have home-canned tomato sauce during the winter.